Jeff city is HILLY. Lots of good places to eat. Prison brews was good. Trail spur takes you underneath the bridge, then you crank up three loops of a square "corkscrew" to the top and out onto the protected bike path. After a few hours at Paddy Malone's Pub, the ride down on a loaded tour bike was...wheeee! My husband, brother, brother-in-law and I will be riding east from Sedalia and are looking for comfortable lodging in JC. Unfortunately, the Cliff Manor is booked up. What is a good choice close to the bridge? We want to avoid a lot of additional street riding, if possible. I know there are many chain hotels/inns in the area but don't know enough about navigating around JC on a bike. Also, do any of the chains offer pick-up at N. Jefferson trailhead? Thanks! If you want to stay in a Jeff City and do the tourist thing, great. But it is a 4-5 mile (one way) ride from Katy to a place to stay. North Jeff City does not have a good option (IMO). Why not either A) Stay in Hartsburg, or B) Ride 10 miles on to Tebbetts and stay at the hostel? ......because if it boils down to staying in Jeff City, or spending extra time at Cooper's landing (near Easley), that is an easy choice for me: Cooper's Landing any day. Then, either limp into Hartsburg (with good overnight options) or get to Tebbetts and stay at the shelter (which is also a good option, but bring food with you). We will be staying at the Baymont Inn in Jefferson City. 3.2 miles from KATY trailhead. It's less than a mile of on-street riding from the south end of the bridge to the motel with only two turns to negotiate. Doesn't look too bad, but we can walk the bikes if we have to. Why JC? For us it was to make a short riding day and a motel stay after three nights of camping. Capitol Plaza is another option. Easy 2.6 mile ride from the trailhead. Probably a little more expensive than the Baymont but its a couple of blocks closer. Another option is to go to Air B&B or VRBO. On Air B&B you'll find 1914 W. Main, at $220/night. I know the owner and have been in the house, it is a beautiful home. It is probably about 3 miles from the N.Jefferson Trailhead. It is all on W. Main. Depending on the time of day traffic may not be bad. But we don't have many streets with bike lanes, so if you use this option just be cautious. There is a pizza place a block or so away, and a café where you can have breakfast in the morning. On VRBO, there is another property, #842553 in the 712 E. High St. They charge $400 for the whole house. It is also about 3 miles from the trailhead. It's a block from my home. I don't mind biking that route. It is much more hilly, but less traffic. I am 64 and used to hate hills, but have gotten to where I can tolerate them. There are 2 nice restaurants about 3 blocks away where you could have a nice dinner. If you chose this place you should ask the owner if they might provide a shuttle from the N. Jefferson Trailhead to the home. The couple that owns this property also own the Jefferson City Trolley Co. They might be able to send their trolley to shuttle you and your bikes. You'd probably have to pay extra, but you could avoid the hills that way. Their place is called the High St. Retreat Center, 712 E. High St., Jefferson City, MO 573-619-4377. Thanks to all for the excellent advice. In response to a few questioning why Jefferson City: my brother and brother-in-law are returning to Sedalia via Amtrak to pick up their rental car to KC airport to catch their flight back to LA. We are meeting them in Rocheport and riding just the final leg of their Katy journey together. 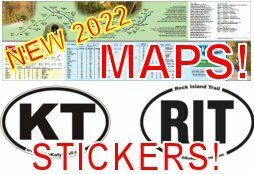 What is the best route by bicycle from katy Trailhead in N Jefferson to the Amtrak Station in Jefferson city, MO. We're riding the Trail from Hermann and will ride Amtrak back. This is a super easy trek. Simply take the Katy Trail Spur over to the Missouri River Bridge. You look like you will be going under the bridge and actually will. Follow the gentle ramp up, up, and up to the Bike/Pedestrian Bridge. This is the only way you can cross the bridge as one of the bridges is down for maintenance and traffic is horrible.. Once you cross the bridge turn left on West Main. As you go down the Hill you will see the Missouri State Capitol building. At the bottom of the hill there is a great bike shop called Red Wheel, Tell Nick, Eric sent you... Then continue up and around the Capitol building drive, to the right, it is a circle drive. When you get to the opposite side of the Capitol building, turn right on to East Main. Go to the first stop light and turn Left at Madison Street. Go to the bottom of the hill and you are at the Station.. Good Luck!! Will possibly be parking at Mokane trailhead and riding to Jefferson City. Might have to leave vehicle overnight. Would this be OK and would vehicle be safe there? Leaving a vehicle overnight in Mokane should be fine. Thieves are opportunist just waiting to happen. I have heard that there are now 3 primitive camping sites at Noren River Access but can't find much information about it. I was hoping someone could confirm this or provide more information. Thanks! They are managed by JC Parks and Rec. Here's a link to their site. I think there are 4 or 5 primitive campsites in the vicinity of the Noren Access, on the north side of the Missouri River, close to where you get on the pedestrian/bike bridge. Go to the link that Jim provided for more info. I think it is first come first serve, and on the honor system. So you may not be able to reserve it. This is a side trip that I highly recommend. The capital and grounds are beautiful. Got a little off course going from Katy to Capital but local rider took me on into town. Very helpful and friendly. Grounds keepers visited with me and suggested Arris for pizza as did the bicyclist that showed me the way to town. I had pizza two days in a row and could not eat anymore. It is located next to capital on W High Street. W High has a number of places to eat but stopped at The Grand Cafe on same street with some outside seating.. Locals told me that the hamburgers were very good and that the potato chips were home made. It was one of the best hamburgers I have eaten. They gave me a little ketchup and mustard bottle to doctor the burger as I wished but this is the first time I have eaten a whole hamburger without adding anything to it. If you feel like pizza try Arri's but for a burger, I have to suggest you try the Grand. I think I also saw Subway long here too if you want a sandwich. Good feedback, thanks! We'll be spending the night there in October and plan to see the capitol and the Thomas Hart Benton murals. Will look for the burger spot! Arris' Bistro is one of my fav places to eat in Jeff City. It is across 50 from the Capitol. Plaza hotel. D is next to another hotel that I don't know what it's name is now. I must say, I am not such a fan of Arris pizza, but the bistro has some of the best salads and pasta! Several years ago I read that Missouri's capital was ranked second in the most beautiful capitals to see. Everest Cafe on Missouri Boulevard is amazing and worth the trip-in a car. I wouldn't bike down Mo Blvd. It serves Nepalese food and is so good. No fried food and no butter in the place. Highly recommend! I tend not to eat at chain places, either. For a good sandwich, Sub Shop can't be beat. It is at the corner of Missouri Blvd and Dix road. Homemade bread and all sandwiches are toasted. So good. Although biking Missouri Blvd is not my idea of a good time the city has added sidewalks on the south side for most of its length. The Greenway bike/pedestrian path also runs parallel to Missouri Blvd for quite a ways. I will be vacationing at Lake of the Ozarks in June with 3 other girlfriends and would like to drive up to Jeff City and rent bikes for the day. Where are there bike rental businesses along the Katy Trail in Jeff City? I don't know of any bike shops in Jeff City that rent bikes. In that area I would go to Trailside Cafe and Bike shop in Rocheport, right on the trail. The Red Wheel Bike Shop, 400 West Main, Jefferson City, began offering bike rentals in 2014. It is located just two blocks from the Missouri River bike/pedestrian bridge, which takes you to the North Jefferson City Katy Trailhead. The bike shop also sells a large selection of bikes and accessories and offers full-service repair. Red Wheel is not on Main its at 2701 West Edgewood. You can get there via the Greenway from the Katy but it's several miles. Hartsburg Cycle Depot is at 2004 West Main but I don't think they rent bikes. Whoops......I should have looked before I posted. I didn't know Red Wheel had opened their new place on Main. Highly recommend the Baymont if not camping. They gave our group a great discount including breakfast because we were trail riders. Bike storage is available. In addition they've been known to pick up riders at the trailhead if necessary. Very friendly too. Its not on the list above but look up Prison Brews Resturant & Bar. Its not a bad ride from the trail but it is a bit off the trail. But the food and the service is well worth the trip out of your way. Also the ride over the bridge and going past the old Missouri Prison is a great view. Stop in, you won't be disappointed. I agree, we walked there from the Capital Plaza Hotel, was glad to be off of the bike after a long day in saddle. Great place to un-wind. Friend and I will be doing 3 days on the Katy next week. What's the best bet for a hotel in Jefferson City? One within easy riding distance of the trail, or any that offer a shuttle to pick you up? 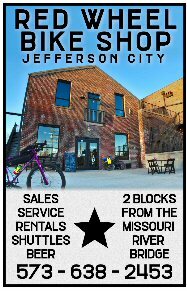 Click on Jefferson City on the Trail Map above and select the lodging search box. Cliff Manor B&B is the closest and always gets good reviews here. Hotel Deville and Capitol Plaza Hotel (not in the list) are the next closest. All within easy riding distance from the North Jefferson trailhead via the Jefferson Greenway accross the new bridge bike/pedestrian path. Baymont is also not far from the bridge.